Centurion Group provides rental equipment and specialist services on a global scale. The group supplies experienced personnel and a single solution via its portfolio companies, which comprise Conserve Oilfield Services, Jacks Winches, RentAir Offshore, Seanic Ocean Systems, Tristar Water Solutions and MCA. Centurion Group operates in the UK, Europe, Middle East, Africa, Americas and Asia Pacific, and offers international capabilities across a full range of rental equipment and support services in the energy industry. Conserve Oilfield Specialists, a Centurion Group company, is an established market leader in the rental and sale of a comprehensive range of DNV and EN-certified offshore cargo carrying units (CCU), containers, baskets, chemical transport tanks, associated equipment and services for the global offshore oil and gas industry. With more than 15 years’ experience of working in the North Sea and supplying CCUs for clients operating in Alaska to Australia and Africa to Azerbaijan, the company is constantly looking to develop its range to include innovative concepts that offer improved safety and added value. Jacks Winches offers an extensive rental fleet of quality lifting, jacking, winching and load monitoring equipment via locations in Western and Northern Australia and Singapore. The company’s experienced personnel has the necessary knowledge and partnering approach to support customers and to deliver an outstanding service and reliable, safe equipment. Jack Winches configure and test all equipment to ensure clients’ requirements are met to the highest standard. The company’s infield services include technicians to assist with commissioning and operation of equipment, ensuring a seamless end-to-end service. 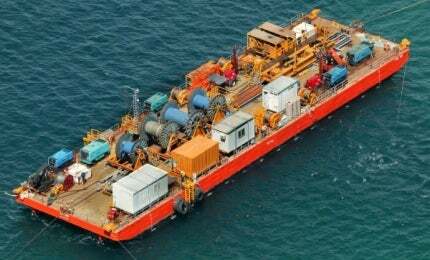 RentAir Offshore supplies specialist rental equipment to the offshore energy industry. The company’s range of equipment includes air compressors and accessories, heat suppression systems, heat exchangers, steam generators and sand filters, which are designed for Zone II, Safe Area and Rigsafe Specification, in addition to DNV 2.7-1 and DNV2.7-2 certification standards. RentAir Offshore’s core products support the needs of major oil and gas companies in the production of oil and gas, well testing, high-pressure pipeline, rig repair, maintenance, drill cutting handling and renewable energy. The company understands that delays, non-availability or breakdowns incur significantly high costs, and that service levels and equipment reliability are critical for their customers. RentAir Offshore’s proven quality, reliability and expertise help clients to maximise productivity. Seanic builds products that ROVs use to interface with subsea hardware. In addition, the company sells and rents standardised industry products, develops customised engineered tooling solutions, manages field services and operations, oversees IMR programmes, and provides integration and storage of client’s products. Seanic engineers and develops customised intervention products to power an ROV as it faces project challenges. The company’s real-world experience assists clients by combining cost-effectiveness and efficiency into an ROV tooling package that suits their project needs. The company also offers standard product tool lines that are immediately available for rent or purchase. Tristar Water Solutions offers a complete range of services for water and wastewater treatment systems. Its rental fleet includes all types of waste and potable water treatment plants, which can be made available at short notice. The units are of robust, modular construction with plug-and-play technology, so installation times are minimised. Simple to operate and extremely reliable, Tristar’s treatment plants are ideal for applications such as exploration companies and other mobile work crews requiring facilities for short periods. Mining Camps Australia (MCA) engineers, manufactures and installs portable and temporary accommodation units, kitchen units, laundry units and mess rooms. Mobile camps can be configured to suit client requirements and are available for hire for periods to suit the needs of the client. Camps can be delivered to any location and are installed and maintained by MCA’s team of qualified and safety focused professionals. The units are designed to provide the highest level of comfort, yet are robust enough to handle all climates and conditions experienced in remote mining, exploration and construction environments.